lol!! Poor Patsy! Yes, just take a vacation from each other instead of getting divorced, because it’s a really awesome quilt. 😀 The times that I’ve felt that way about a quilt, so boxed it up and put it far back on the shelf for months (or years), something lovely happened afterward when I came back to it. Each time I liked it much, if not loved it, in the end. Hey Patsy, I like your quilt, but know what you mean about some quilts. Maybe when it comes back you’ll like it better, but if not, you can send it my way. 😀 😀 😀 😀 By the way, I really like your white on white quilting. Very inspiring. 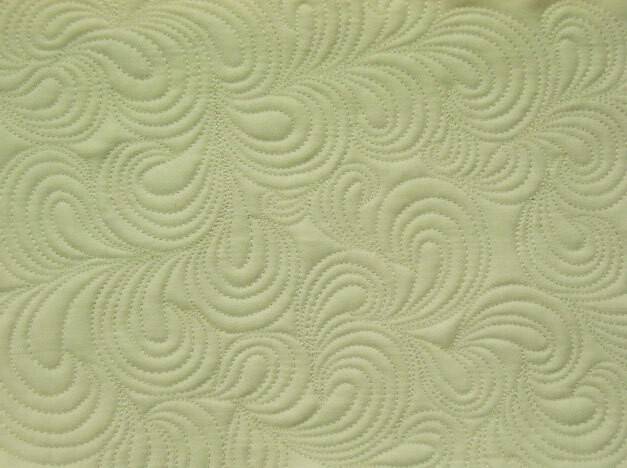 Patsy — love the quilting… why the divorce ? 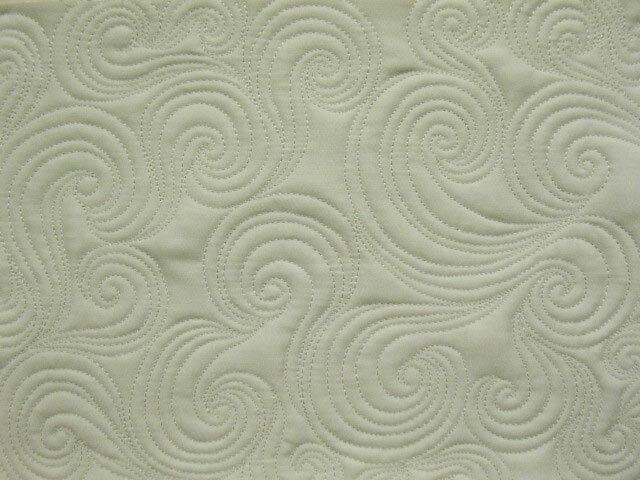 I really like how the quilting in the pieces gives it movement and the first ones remind me of waves, nice for a nautical quilt. I love the whole cloth look of the quilting on the white fabric – quilting negative space and very densely has become a fascination of mine and I plan to study and practice much more! So…I was surprised…off to a long arm for basting??? No 505 & the ‘wall’?? I ended up getting a Grace frame and a new Janome 1600P and I love the set-up! It’s a compromise between having a Gammill 12′-er and sticking to my Horizon. I’ve only done a couple tester cheater panels but it is sooo much fun!!! 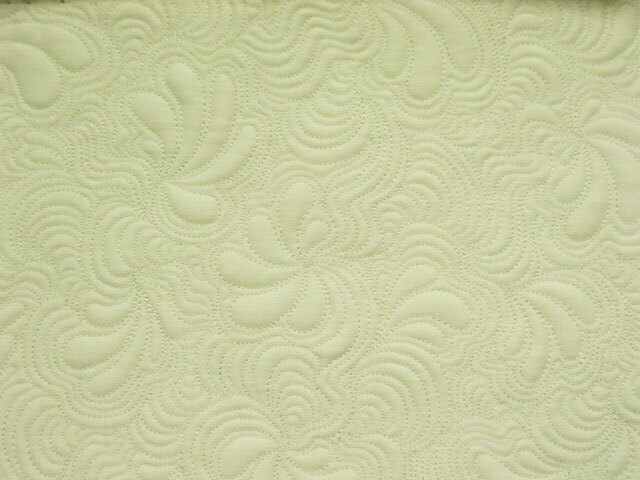 Quilting those beautiful swirls & feathers will be lots of fun!! 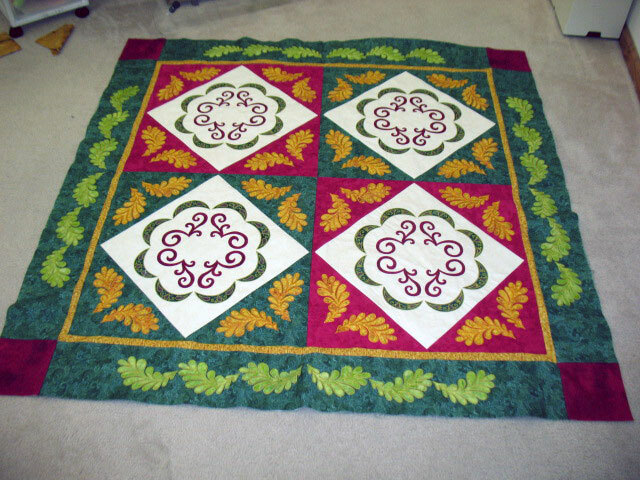 I think your stitching is beautiful and this quilt is gorgeous. Missing what you are finding as the problem. 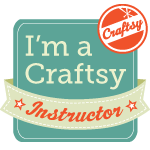 You are so very talented I’m sure you’ll make it even more spectacular with your beautiful FMQ.